Nadeshiko Kagamihara is a young girl from Nanbucho. She is very cheerful and energetic, but easily forgets things. She also likes to eat a lot. 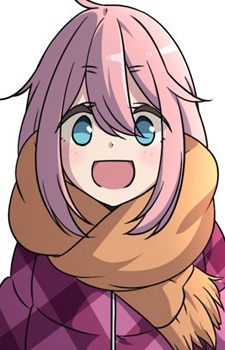 Nadeshiko has long pink hair which she keeps in twin ponytails on the back of her head (held by white ruffled scrunchies), light blue eyes, and pale skin. When camping, she wears a plaid pink jacket, a light pink ruffled dress underneath, black leggings, and green-and-white lace-up boots (or, alternatively, dark brown boots that are rolled down) with grey fingerless gloves and an orange scarf. In school, she wears the typical female uniform (seifuku, 制服). She's currently wearing the winter seifuku. Her birthday is same as Aoi Inuyama's.